The good news: It is possible that all of wave *c* and .ii. are complete at the 1205.10 low and wave .ii. higher has now started. The bad news: We will need to see how gold trades in the days ahead, but for now we are still thinking that one more drop to at least the 1204.00 low appears likely. 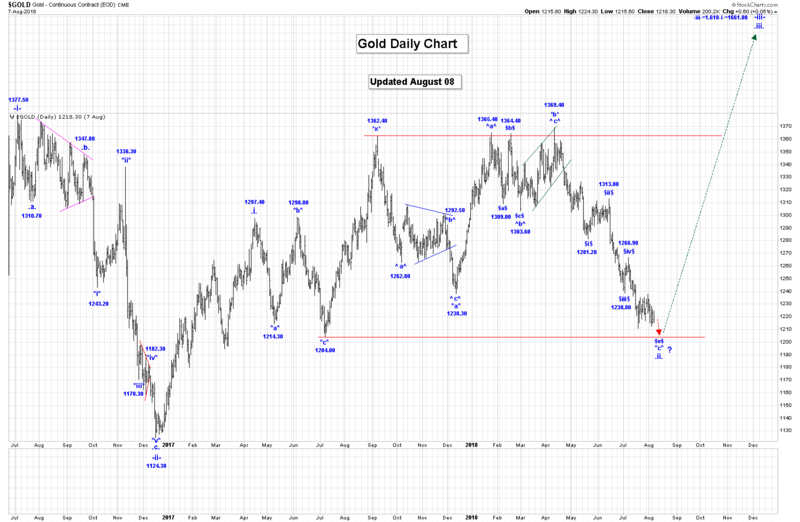 Gold is very oversold and at record extremes with various other technical indicators. This is important: Elliott Wave Theory (EWT) suggests that at the end of corrective wave .ii.’s that the market psychology is very bearish (in a bull market)… even more bearish then at the start of a move higher. I believe we have that sentiment now. Investors should not be frustrated but instead use this buying opportunity to their advantage. Upon completion of wave .ii. we expect to see gold trade above very strong resistance at the 1360.00/1370.00 level, and likely into the 1500.00 area. 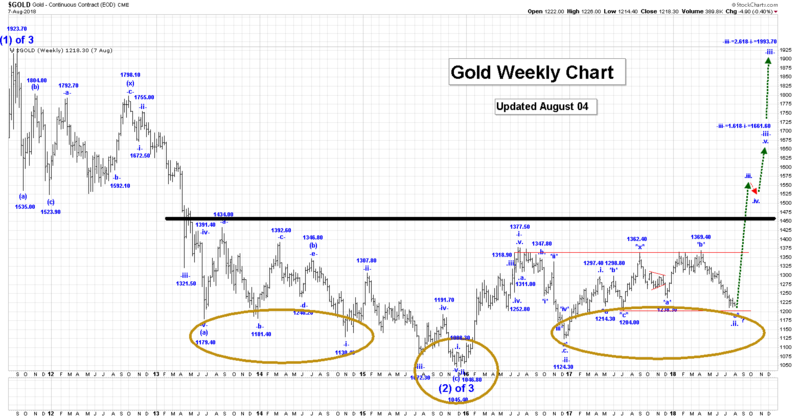 As investor can see on this weekly gold chart, wave .ii. has become a double 3 wave corrective pattern, and that is nearing completion. Trading Recommendation: Go long gold now. Use put options as stops. Aggressive traders should consider adding to long positions here. Active Positions: We are long, with put options for risk management! It could now be possible that wave .ii. 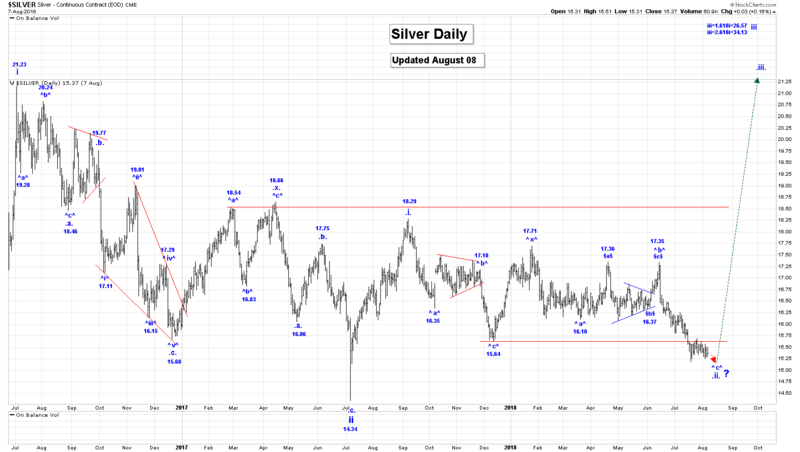 in silver is now complete at the 15.14 low, and that wave .iii. high could have now begun. We will give this market a few more days to confirm this observation. A rally and close above the 15.64 low would be very good sign that the fortunes of silver have started to turn to the upside. Like gold, silver has many indicators at extreme/record levels, which is indicating that a reversal to the upside is likely imminent. If it materializes as our counts project, the expected sharp rally in wave .iii. would see silver trade well above major resistance at the 18.30/18.50 level. Once wave .i. ends we expect a very sharp rally in wave .iii., to be the next major move in this market. Wave 2 = 13.67. Note that wave 2 retraced 78.6% of the entire wave 1 rally. Wave 3: In play now. 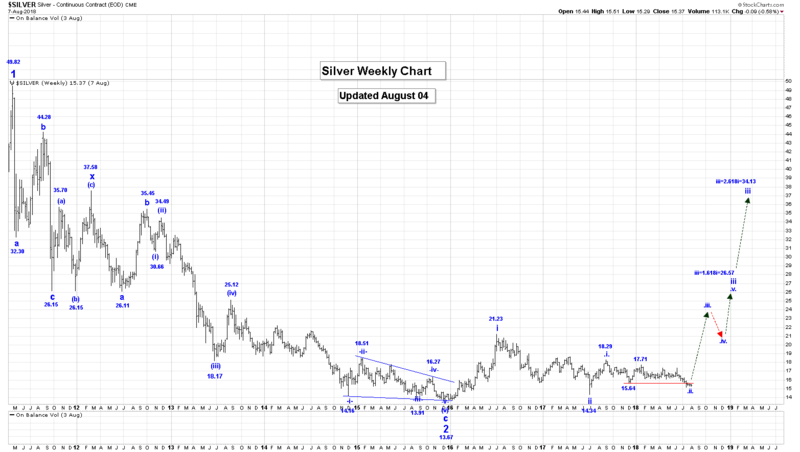 Trading Recommendation: Go long silver. Use a put option as a stop. Aggressive traders should consider adding to long positions here. Active Positions: We are long, with puts as stops! Free Offer For 321Gold Readers: Send me an email to admin@captainewave.com and I’ll send you our “IS THIS IS THE GDX LOW?” report. I highlight the key short-term wave counts for GDX, and what I’m looking for to signal the imminent rally will have legs! Risk: captainewave.com is an impersonal advisory service and, therefore, no consideration can or is made toward your financial circumstances. All material presented within captainewave.com is not to be regarded as investment advice, but for general informational purposes only. Trading stocks does involve risk, so caution must always be utilized. We cannot guarantee profits or freedom from loss. You assume the entire cost and risk of any trading you choose to undertake. You also agree to bear complete responsibility for your investment research and decisions and acknowledge that captainewave.com has not and will not make any specific recommendations or give advice to you or any of its clients upon which they should rely. captainewave.com suggests that the client/member test all information and trading methodologies provided at our site through paper trading or some other form of testing. captainewave.com, its owners, or its representatives are not registered as securities broker-dealers or investment advisors either with the U.S. securities and exchange commission or with any state securities regulatory authority. We recommend consulting with a registered investment advisor, broker-dealer, and/or financial advisor. If you choose to invest with or without seeking advice from such an advisor or entity, then any consequences resulting from your investments are your sole responsibility. All information posted is believed to come from reliable sources. captainewave.com does not warrant the accuracy, correctness, or completeness of information available from its service and, therefore, will not be liable for any loss incurred. Due to the electronic nature of the internet, the captainewave.com website, its e-mail & distribution services and any other such "alerts" could fail at any given time. captainewave.com will not be responsible for unavailability of use of its website, nor undelivered e-mails, or "alerts" due to internet bandwidth problems, equipment failure, or acts of god. captainewave.com does not warrant that the transmission of e-mails, or any "alert" will be uninterrupted or error-free. captainewave.com will not be liable for the acts or omissions of any third party with regards to captainewave.com delay or non-delivery of the captainewave.com nightly emails or "alerts". Further, we do not receive any form of payment or other compensation for publishing information, news, research or any other material concerning any securities on our site or publish any information on our site that is intended to affect or influence the value of securities. There is no guarantee past performance will be indicative of future results. No assurance can be given that the recommendations of captainewave.com will be profitable or will not be subject to losses. All clients should understand that the results of a particular period will not necessarily be indicative of results in future periods. The results listed at this website are based on hypothetical trades. Plainly speaking, these trades were not actually executed. Hypothetical or simulated performance results have certain inherent limitations. Unlike an actual performance record, simulated trades do not represent actual trading. Also, since the trades have not actually been executed, the results may have over or under compensated for the impact, if any, of certain market factors such as lack of liquidity. You may have done better or worse than the results portrayed. No representation is being made that any account will or is likely to achieve profits or losses similar to those shown. No independent party has audited the hypothetical performance contained at this website, nor has any independent party undertaken to confirm that they reflect the trading method under the assumptions or conditions specified hereafter. While the results presented at this website are based upon certain assumptions believed to reflect actual trading conditions, these assumptions may not include all variables that will affect, or have in the past affected, the execution of trades indicated by captainewave.com. The hypothetical results on this website are based on the assumption that the client buys and sells the positions at the open price of the stock. The simulation assumes purchase and sale prices believed to be attainable. In actual trading, prices received may or may not be the same as the assumed order prices.